Criteo AutoRoll Widget, a new widget for blogs, is looking for beta testers. AutoRoll is the blog roll of your blog's readers. It’s a widget that displays links to blogs your readers are visiting the most often. Criteo traces the number of visits of each unique reader on each blog that has installed AutoRoll. The more often a reader visits a specific blog, the greater his affinity is with your blog. It takes one minute to install: http://widget.criteo.com/. These blogs were chosen as the seven best wine blogs by Food and Wine magazine in October of 2005 - and they're still around, so they must be doing something right! JoeDressner.com - Dressner is part owner of Louis/Dressner Selections, an American wine importer specializing in small producers. Vinography - Alder Yarrow is a San Francisco high-tech consultant and self-professed wine geek. In addition to wine writing, he includes restaurant reviews. Jamie Goode's Blog - Jamie Goode, a Brit, writes for several well-known English wine magazines and runs the Wine Anorak Web site. Dr. Vino's Wine Blog - Tyler Colman really is a doctor - he wrote his doctoral dissertation about the political economy of the wine industries in France and the U.S. He writes about the intersection of wine, politics and business. Veritas In Vino - The wine and travel columnist for Time magazine, Alice Feiring covers everything from biodynamic winemaking to good wine stories. Wine Tasting, Vineyards, in France - French photographer Bertrand Celce travels the wine routes of his country and records his encounters with his camera. If you post your Archie McPhee wishlist in your blog, Web site or myspace account and win their random drawing, they will buy your list for you! That's right, just post your list, complete with links, and there's a chance that all (or at least $200 worth) of your dreams will come true. The contest ends November 15. Using only a hoe and a large glass of water, I once single-handedly defended a small village in the Amazon Basin from a horde of ferocious army ants. I play bluegrass cello, I was scouted by the Sox. I am the subject of numerous documentaries. When I'm bored, I build large suspension bridges in my yard. I enjoy urban hang gliding. On Wednesdays, after work, I repair electrical appliances free of charge. I am an abstract artist, a concrete analyst, and a ruthless bookie. Critics worldwide swoon over my original line of corduroy evening wear. I don't perspire. I am a private citizen, yet I receive fan mail. I have been caller number nine and won the weekend passes. Last summer I toured Northeast Asia with a traveling centrifugal-force demonstration. I bat .400. My deft floral arrangements have earned me fame in international botany circles. Children trust me. But, I did not write this. 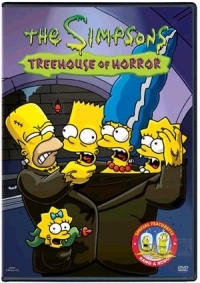 The Chowdaheads blog has posted video of all 16 of The Simpsons "Treehouse of Terror" episodes. Inside bloggers will be covering the Wirefly X Prize this week - reporting on everything from the three main competitions to the Rocket Racing League and other exhibits. The Wirefly X Prize blog went live on Oct. 18. The Wirefly X PRIZE Cup is a two-year competition modeled after the original Ansari X PRIZE to further commercial space flight. The 2006 Cup features lunar landings, Space Elevator games, the Rocket Racing League's development X-Racer and more. And, best of all, you can watch it all live via webcasts too. Terry Teachout of the Wall Street Journal recently spent hours poring over YouTube to find us the good side of YouTube - the part that's not mentioned often - namely, that there are hundreds of classic performances available to view on the site (in addition to the countless videos of kids splashing in the pool, like I have on MyTube). In addition to the mind-numbing video flotsam and jetsam, there are some of the greatest classical and jazz performances of the 20th century available too: Louis Armstrong, Duke Ellington and other celebrated artists. Most of the clips are drawn from films of the '30s and '40s and TV shows of the '50s and '60s and was previously available only on DVD.